Designing for high performance serial transceiver applications using series 10 ALTERA FPGAs Arria® 10 GX 1150 KLEs. Expand I/O connector with 2 connectors in order to improve a front end of 32 high speed link. JTAG header provided to program the MAXV and access to the Arria® 10. 1 x RJ45 copper connector 10/100/1000Base-T Ethernet (Through RGMII PHY) connected to the FPGA. Note: Kit content FMC loopback board with TX/ RX display port connectors. Enables transceiver tuning and Signal Integrity verification. Note: Kit content EXT loopback board with QSFP+ connector. Input 2: Dedicated default input clock for the SI341 from on board 100 MHz oscillator. On board UART over USB solution on Max 10 (µUSB connector). 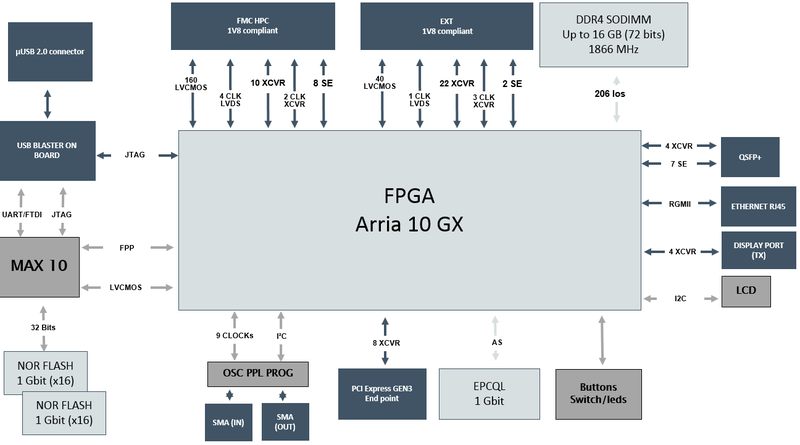 The Arria® 10 FPGA FMC IDK includes hardware such as FMC Header, on-board USB Blaster, DDR4, PCIe capabilities and much more. 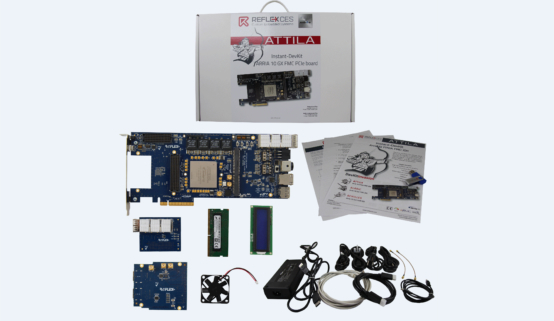 *The USB key contains documentation (Starter Guide, Reference Manual, Schematics, Assembly files and Productbrief of the Kit) and test design of the board. 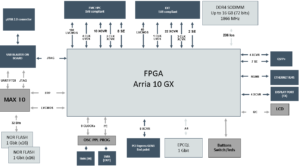 When using the Arria® 10 FPGA FMC IDK for the first time the user can launch the innovative Graphical User Interface and discover the Kit interfaces, applications and performances. 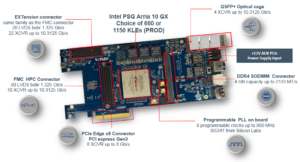 You can manage 8 internal clocks up to 800 MHz onboard with innovative programmable PLL drive by I²C bus connected to the CPLD MAX10 and the FPGA Arria® 10 GX. 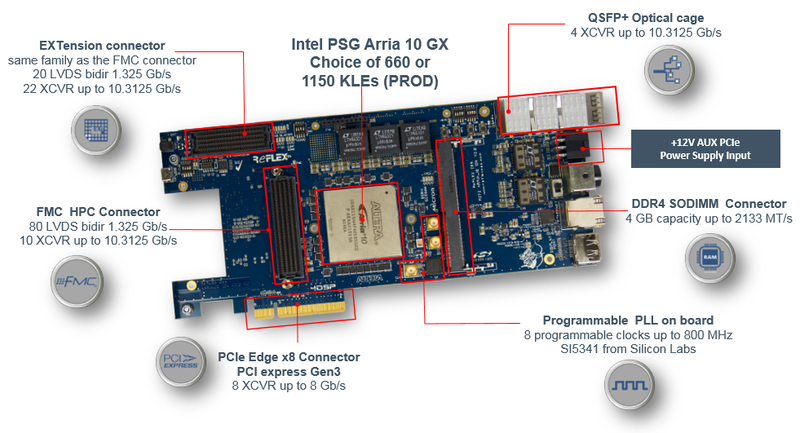 Finally, the ATTILA board has a high end digital core based on Arria® 10 GX. It is connected to a 4GigaByte DDR4 SODIMM module. How to program my MAX 10 and Arria® 10 on my Attila board? 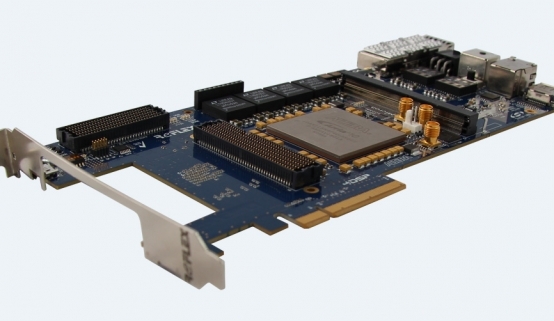 Scenario 1: You can program the FPGA Arria® 10 and/or the MAX10 through USB blaster in JTAG mode. Scenario 2: You can program the Arria® 10 with an image that is contained in Flash, in FPP 32 configuration mode. Scenario 3: At power-up, Arria® 10 automatically loads via a quad serial interface with its dedicated FLASH EPCQ, in AS configuration mode.